← Quatchi’s Sport of the Day: Giant Slalom! MPR529 filmed this scoreboard guessing game at General Motors Place Canada Hockey Place. I can’t figure out how to embed it, so watch it here. This appears to be the full Meet the Mascots on Ice program, filmed by IChooseYouZubat. Skip ahead to the four-minute mark to see Quatchi’s big entrance — I love the part where he gets helped into his hockey sweater. There are a ton of YouTube videos of people goofing around with mascot plushes. Here, Kate Spiller compiles photos of her Quatchi plush at locations and events all around town. 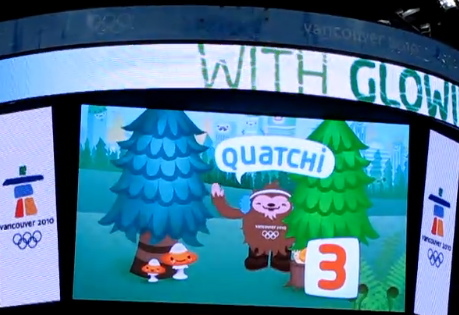 Lastly, as we’ve said before, not everybody loves Quatchi. Fair enough, but must he be beaten with a shovel, run over by a car, and set on fire? From adsump. In the next installment of Quatchi Video Roundup, I hope to have footage of Quatchi rocking out at tonight’s Devo concert! Wishful thinking to be sure, but you never know. This entry was posted in Uncategorized and tagged animation, hockey, Meomi, Miga, protest, Quatchi, Sumi, video. Bookmark the permalink. This quatchi execution is the most devastating thing I’ve seen in awhile. My quatchi is crying in fear that this monster will come after him… I’m hoping it’s fake, edited to look like the quatchi is burning but the real quatchi isn’t. I’m so upset!